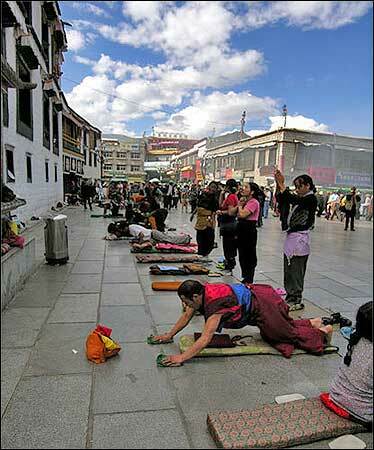 Worshipers -- Jokhang Temple, Lhasa. The recent so-called "anti-West" protests occurring in China and beyond against French supermarket chain Carrefour, the CNN and the BBC are doing much of the work the pro-Tibetan supporters have been trying to do: expose the ruthless oppression that lies at the heart of China. Rather than engage in a dialogue about the causes for the March riots that occurred in Tibet, Chinese nationalists are targeting anyone who strays from the party line. Hu Jintao, the Communist Party secretary responsible for the Tibet Autonomous Region from 1988 to 1992, oversaw the 1988 crackdown when at least 18 people were killed and over 150 seriously wounded on one day alone -- March 5, 1988 -- according to Mary Craig's "Tears of Blood: A Cry for Tibet." It is no surprise that his regime is stoking nationalist sentiment against anything that appears critical of the Chinese government in a campaign that is worthy of Mao Zedong's brutal Cultural Revolution of 1966-1976. The case of Grace Wang, a Chinese student studying at Duke University in North Carolina, sums up much about the current situation. Wang dared to go against the grain by advocating a dialogue between pro-Tibetan and pro-Chinese demonstrators on her campus when the torch relay was going through San Francisco. She has subsequently been branded a "traitor" and has had her life threatened after "human flesh search engines" -- a euphemism for using the Internet to identify people -- were mobilized to track down her and her family's exact whereabouts. In a related story, 27-year-old Paralympic athlete Jin Jing, the so-called "smiling angel in the wheelchair" who was accosted when waiting for the Olympic torch in Paris, branded the protesters "human rights tramplers." No word about the tramplers in Tibet. When asked in an interview what she thought of the threats to those who did not agree, she told the BBC she hoped it would be an "educational experience" for them. But in a bizarre twist that says much about the madness of recent events, the China Digital Times reports Jin has now fallen from hero to traitor for expressing doubts over a Carrefour boycott. China is currently embodying Gertrude's observation in Hamlet -- protesting too much to cover something up. All the bickering and false accusations are desperate attempts to obscure the fact that Tibetan culture is currently being decimated under the auspices of Beijing. Few cultures could have survived an invasion of the magnitude that Tibet experienced at the hands of the Chinese in 1959. Everything from the basic food staple, tsampa -- roasted barley flour -- to the current Dalai Lama was targeted in the wake of the brutal takeover. The so-called liberation left monasteries gutted and claimed over 1.5 million lives. As the Dalai Lama escaped across the Himalayas disguised as a soldier on a white pony, Mao Zedong was heard to say, "We have lost the battle." Indeed, Tibet has overcome the odds and its core institutions continue to endure, albeit in an increasingly crippled form. As the carnage of the Cultural Revolution began to subside in the mid-1970s the Chinese realized that Tibet's pristine wilderness and rich traditions were worth preserving, if for only one reason: their tourist cache. Over the years the Chinese authorities have pursued various methods to forcibly assimilate Tibet into the fabric of China. In 1965, the Tibet Autonomous Region was created by slicing off huge chunks of Amdo and Kham and folding them into the Chinese provinces of Qinghai, Gansu, Sichuan and Yunnan. As with many institutions in China, names can be deceiving -- TAR has been anything but autonomous. During the Cultural Revolution of the '60s and '70s, Tibetans suffered massacres and starvation while witnessing Red Guards raze their cherished temples and monasteries to the ground. From the late 1980s, after reformer Hu Yaobang was replaced as Communist Party secretary, a different tack was tried by Hu Jintao. Huge numbers of Han Chinese were lured with cash incentives to Tibet, marginalizing the indigenous population into a minority group within their own homeland. Official numbers put Tibet's population at 2.6 million, but how many of these are actual Tibetans is hard to say. No independent study has been conducted or allowed by China to determine Tibet's ethnic composition. The government says Tibetans make up about 93 percent of the population, but the Han influence is disproportionate. 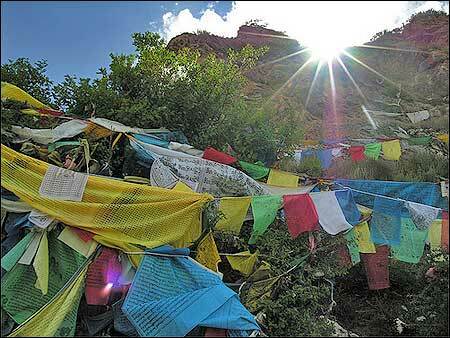 The Chinese dominate its economy and other spheres of influence, threatening Tibet's cultural identity. There is little doubt that the Chinese government uses figures that are designed to downplay the presence of Chinese settlers. 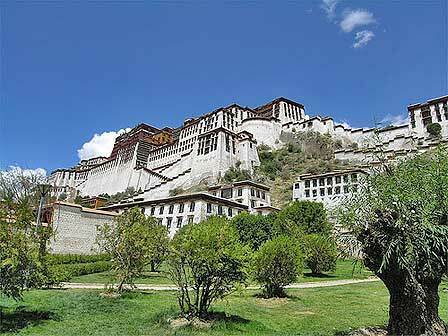 However, any visitor to the capital of Lhasa can confirm that the majority of residents are Han Chinese. When I visited in the summer of 2006, just after the opening of the Qinghai-Tibet railway, I met a Tibetan who I will call Dorje. Although he acknowledged that the influx of Chinese investment could help the impoverished region, it had not had much of a positive effect for him and other Tibetans who did not speak Putonghua. In fact, they had come under increased suspicion from authorities who questioned their allegiance to Beijing. Lhasa under the Chinese Communist Party resembles a typical Chinese city complete with karaoke bars and cell phone shops. A steel telecom tower sits on top of the once holy hill of Chagpo Ri beside the Potala Palace. Come nightfall, it is illuminated into a garish neon red replica of the Eiffel Tower. The Tibetan population has been squeezed into a small area around the Jokhang Temple while the steady influx of Chinese continues to expand the city boundaries, shooting up the price of real estate and other commodities. As long as the oppression of Tibetans continues to be denied, the greater the need will be for Chinese nationalists to manufacture an enemy.